Make your own scented candle melts or candle tarts by melting down the wax from all your old candle stubs. These fragrant slips of wax potpourri are widely available commercially and are sometimes called scented candle chips or potpourri candle tarts. Whatever the name, essentially candle melts are some form of candle wax that is scented with essential oil or candle fragrance. They are usually warmed to melting point in either a tea light burner or electric diffuser. I think you’ll find that making your own candle tarts is a satisfying way to recycle old candles and a lovely way to scent your home. Why not make a few extra, using favorite scents of family and friends? 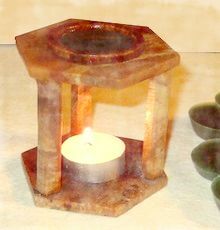 Add an inexpensive tea candle wax melt warmer and you have an unusual, yet personal, homemade gift. pout. See photo at right for details. 2. Fill the tin can with clean stubs of candle wax. Make sure the wax does not contain labels or pieces of candlewick. You can use a mixture of colors, or just stick to one color if you have enough available. Add five to ten drops of essential oil – some nice ones to try are lavender, patchouli or sandlewood. 3. Fill the saucepan with a few inches of water and place the can in the middle of the saucepan. Bring the water to a slow, simmering boil until the wax melts completely. You may find that the tin can tends to travel around the saucepan, or threatens to fall over, so use the metal tongs to steady the can and prevent any accidents. Absolutely do NOT leave the stove unattended during this step. 4. Use tongs and oven gloves to remove the can of melted wax from the saucepan. Be careful! The can will be hot and is full of boiling wax. 5. Pour the wax into each division of a mini muffin or tart pan. If you have wax left over, you can let it harden in the tin can and reuse it another time. 6. Let the wax cool completely. For easy removal of the wax candle melts, place the muffin pan in the freezer for half an hour to loosen the wax. Turn the muffin pan upside down over a flat surface and tap the back of it sharply to release the candle melts. They should fall out quite easily. 7. To use your candle melts, warm to melting point in a tea light burner or electric candle melt warmer.